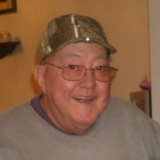 Leroy “Wayne” Davis, 80, of Plattsburg, MO formerly of Gower, MO passed away, Monday, April 15, 2019. He was born on December 28, 1938 to Roy F. and Viva (Mumford) Davis near Gower, MO. Wayne grew up near Gower and graduated from Gower High School. On May 27, 1960 he was united in marriage to Elaine Farr. After their marriage they lived in rural Gower where they made their home.Wayne retired from TWA after 32 years as an airline mechanic. He enjoyed many years at the Lake of the Ozarks. He loved hunting, fishing, boating and riding his Harley. He was preceded in death by his parents; son-in-law, Pat Livingston; brother-in-law, Donnie Farr, and sister-in-law, Beverly Farr. Wayne is survived by his wife, Elaine; daughters, Deborah (Harold) Barnhill and Donna Livingston (Kirby Crump); grandchildren, Korey Barnhill, Bailey Livingston, and Carly Livingston; and great-grandson, Parker Miller; brothers-in-law and sisters-in-law, John (Pat) Farr, Bob (Carol) Farr, and Marianne (Jerry) Jackson; several nieces and nephews, and other relatives. Graveside Inurnment: 12:00 p.m. Friday, April 19th at Number Six Cemetery, Gower, MO. Donations may be made to Number Six Cemetery.